The idea comes from a thought on nature, its ever pushing life blood and its way of being always diverse and surprising, adapting to any environment and be simply beautiful. Water is one of nature's most important gifts, what makes Earth to seem unique among the other known celestial bodies. In ancient cultures water represented the very essence of life and has played a role not only in the history of countries, but in religion, mythology and art. Essential to life and so discrete that people sometime seem to forget about its importance. Apples, fruits associate with love, beauty, luck, health, wisdom, temptation and sexuality since the most traditional stories and sayings. Fruits so charming in their shapes and colours and so involving in their natural simplicity. “Water the apples” is a way to remind people how simple, beautiful and essential is nature and its expressions. Water, so unique and essential for everyone life and apples so diverse and beautiful in their shapes, colours and gestuality. Like apples are different in shapes and colours so we are, it is all about nature! Water the apples: multiple ways mould. “Water the apples” is a family of drinking glasses inspired by apple shapes. Different apples for different hands so that drinking would be as natural and comfortable as possible. 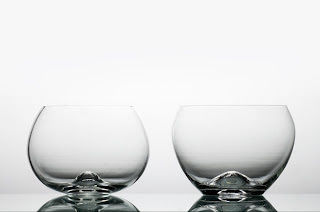 The intent was then to develop a mould able be blown in different ways and give different glasses. The mould is thought to be made of three pieces: 2 pieces for the main body and a plug for the bottom. The main body of the mould is open on both sides allowing to be blown in two different ways. The use of a removable plug is a further solution that enables to have many different variations by changing only a small piece of the mould.